Zen Master Hakuin Ekaku (1685-1768) took up brush painting in the last decades of his life. He was a prolific artist producing over 1,000 brushwork scrolls. His painting and calligraphy were more than a creative pastime, however: they were an expression of his enlightenment and a new way of teaching the Dharma to the lay community. His art transcended the boundaries between high and low, sacred and profane, serious and playful, and verbal and visual. They are the very essence of “no separation.” His rough, simple brushstrokes were also a natural expression of Zen spontaneity and Japanese aesthetics. Hotei also serves duty as one of the Japanese Seven Gods of Good Fortune — the god of abundance and good health. That’s a lot of weight for that happy little guy to carry in his bindle! There’s a Zen story about Hotei. When asked “What’s the significance of Zen?” he put his sack down on the ground. When then asked “What’s the actualization of Zen?” he picked his sack back up and walked away. Clever Hotei! The very essence of Zen — letting go and dropping off whatever we’re holding. The very actualization of Zen — drawing water and chopping wood. Hotei lives life at the crosshairs of the Absolute and the Relative. A lot like Hakuin himself. When Hotei was not busy being all these things, he served double duty as Hakuin’s alter-ego and his Everyman. While Hakuin’s Hotei is a spiritual fellow and sits zazen, he also enjoys the pleasures of secular life. In painting after painting we see him puffing on a pipe (and what comes out of the pipe is not a smoke ring, but the prostitute Otufuko! ), flying up in the air as a kite, playing go, riding a colt, playing kickball, and street juggling. In the above painting, Hotei is watching mice sumo wrestling. The colophon on the scroll simply reads “this is where mice do sumo.”  With the rise of the merchant class in 17th century Japan, professional sumo groups were organized to entertain merchants and commoners, and Sumo wrestling moved from the Imperial Court into the public arena. As a boy growing up in a post station on the well-traveled Tokaido road, Hakuin would have been very familiar with sumo. 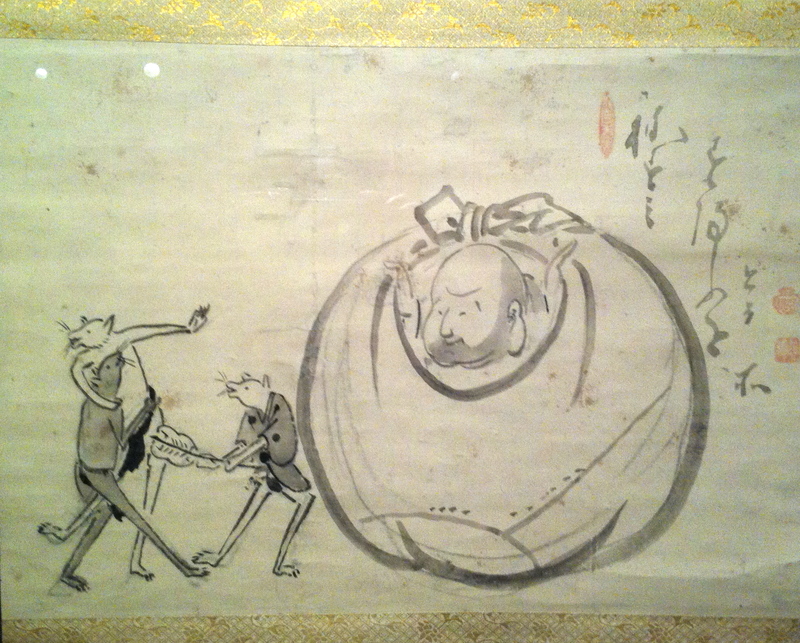 The painting shows two mice rikishi (wrestlers) with an officiating mouse gyōgi (referee) holding a traditional gunbai (wooden war fan). Sumo grew out of Shinto ritual and rikishi live very regimented lives. In Hakuin’s day they were mostly rōnin (itinerant masterless samurai) trying to support themselves. Today’s rikishi live in communal “stables” called heya where every aspect of their lives is governed by ritual and tradition. The first rudimentary heya appeared towards the end of Hakuin’s lifetime. During Hakuin’s era, rikishi took part in ten-day kanjin-zumo tournaments where money was raised for Shinto shrines and Buddhist temples. Hakuin is having fun here, but to what purpose? All of his other scrolls have a Zen message, but the message in this scroll seems somewhat obscure. Could Hakuin have been alluding to parallels between the activities of rikishi and monks? Is Zen training like rikishi training in some way? Is sumo a metaphor for zazen? Could Hakuin have been making fun of sumo by turning the huge wrestlers into small mice? Is Hakuin showing that enlightened beings live with contentment in the world of the ten thousand things? Do the black and white mice represent yin and yang — two, but not two? It all seems so far-fetched, and I have to confess, I have no idea. Maybe, dear reader, you know more about this scroll than I do. I saw it last month at the Japan Society’s exhibit of Hakuin’s painting and calligraphy called The Sound of One Hand. It’s puzzled me ever since. I’d love to hear your suggestions as to its significance. In the meantime I’ll just enjoy it. It makes me smile. P.S. 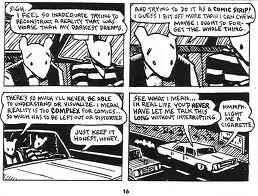 I thought these mice bore a certain family resemblance to another group of anthropomorphic mice — the Ashkenazic mice of Art Spiegelman’s Maus. When I asked Art about any possible family resemblance, he only suggested that Hakuin’s mice must be Israeli mice because of their martial arts prowess — definitely not diaspora mice! P.P.S. 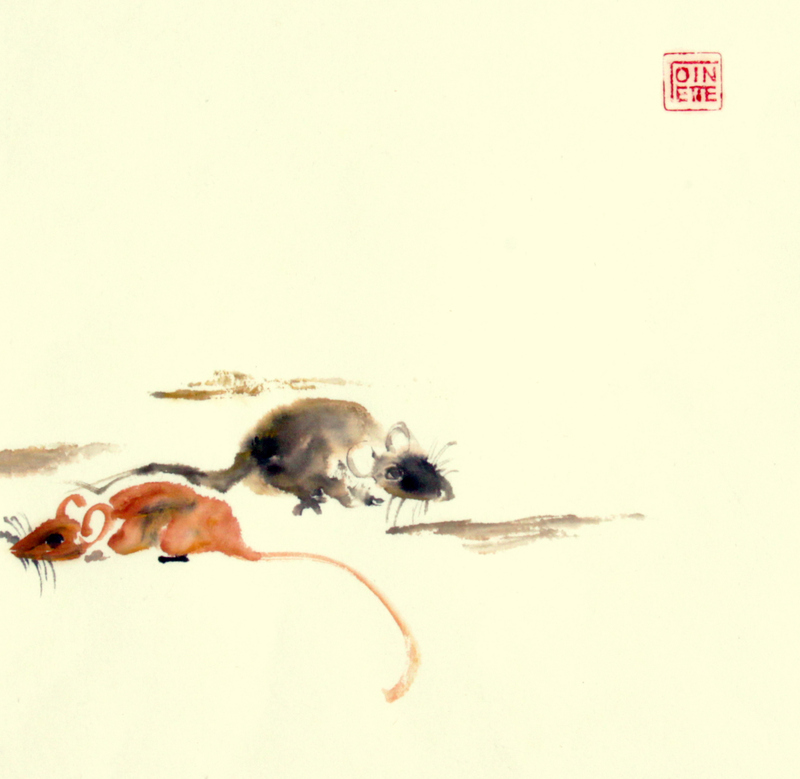 My brush painting Dharma friend Toinette Lippe sent me some of her own mice just to demonstrate that not all Japanese mice are anthropomorphic.